Private Individual Surf Lessons Moliets. Whether you or are a complete beginner or already surf but want to take your surfing to the next level,”Surf lessons Hossegor” will help you progress faster, refine your technique and master new moves! Before the tuition, we will have a short assessment of your surfing capability and tailor a private lesson specifically for you. Troy will take you from a board intro and beach safety right through to perfecting that cutback, getting the duck dive perfect, knowing your way around the line-up or anything else you need to know ….. Troy can put you on the right track! The benefits of working with a private surf coach is its one of the fastest, easiest, most successful ways to improve your surfing, health and fitness. Troy has over 40 years of surfing experience and over 10 years of teaching experience , an extensive knowledge of the local area and a quiver of boards to suit you abilility. 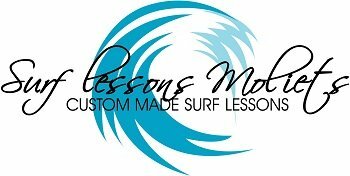 Contact us today and we’ll tailor a surf lesson for you and get you up and riding like a pro! Want to learn with a few mates or your family? Check out our small group lessons. Check out the Prices or Get In Touch with any questions. Look at all of our products here.